This past Sunday I was reminded of one of the many reasons I run. It's not something I think about much, and there are certainly moments when I all but forget about it. This reason goes beyond the personal benefits of running and enters into the philosophical. Put simply, because others cannot run. There are many aspects of my life that can often be taken for granted. Breathing, eating food, being healthy, enjoying the love of my wife - this list could go on for quite some time. Running is certainly on this list. And yet some people would find this surprising. Since I began running in middle school, there has always been a general confusion surrounding why I would ever choose to run. The expressions of the overall communal misunderstanding of why I run has been presented over the years in the forms of jokes, strained faces of disgust, people throwing things from their cars at me, insults or unimaginative movie quotes hurled out as they drive by, or any other number of odd ways. Suffice it to say, the average person I have talked to does not understand the desire to run long distances. Today I do not want to talk about the physical, mental, emotional, and spiritual benefits I believe running offers. I do not want to dwell on the amazing camaraderie that is fostered through enduring mile after mile with another human. I do not want to comment on the many other reasons I have run previously, or ponder on a few that might arise in the future. I simply want to talk about a reminded inspiration this weekend offered me. During a service at Hope Church this past weekend in Cordova, TN, a group of wonderful young individuals came out to perform to one of the songs from the movie The Greatest Showman. Hope has long been a church that offered ministry to and for the special needs community of Memphis. This Sunday service was a wonderful demonstration of how this ministry gives back to the church as a whole, and we surely benefited from their wonderful performance. Such beautiful young adults all giving their best to offer us a gift of dance, smiles, and wonder. It started me on a long train of thought. 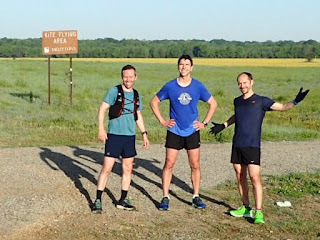 I had run twelve miles the morning before with a friend and my brother. It was a great run and I cherish such experiences immensely. This train of thought led me to thinking on an odd running experience from years past. One of my seminary professors was struggling intensely in his battle with cancer. I became convinced, however silly it might have been, that on one of my runs that the greater I persisted and struggled the more relief he would feel. Strange, yes. But it was also meaningful and I believe there was some mysterious truth in it. I then found myself thinking back on Eric Liddell, who I was introduced to in the watching of the movie Chariots of Fire. 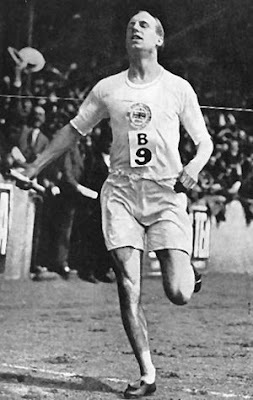 Liddell had a unique running form and would often tilt his head back as he entered the most difficult part of the race. Some have described his face as having an expression of joy, or a wide smile, as he began to push his body into the moment when a person cannot be sure there will be anything left to finish the race. At least one or two accounts I have read describe seeing Liddell run as watching a man who truly loved to run. It must have really been amazing to see a man run who love it so! The method of thought was quite bizarre, but this is how my thoughts work sometimes. From there I was just stuck thinking, as I have in the past on occasion, how lucky I am to be capable of running. During injuries these thoughts are readily apparent. Every time I stop to consider this line of thinking I am always struck by the opposite of the gift of running. There are countless who do not have this gift. Some had it - some never have. One day I will look back on my running days with a longing sense of loss. When I find myself fixated on those who will never experience the fantastic April breeze and sunshine from the perspective of a body loping over trails and through trees, it is with a renewed sense of joy I remind myself of my love for running. Running is a gift. Running is a choice. But there are some who cannot make the choice to go dashing off into the wild - to feel the burn of the lungs, good worked legs, renewing of body and mind through deep breathing, to experience the run in its entirety. Is it an obligation for me to run? No, I do not quite feel that but it is very close! Why do I run? This week I run for those who would love to but cannot. This week as I find myself involuntarily smiling and thanking God for the ability to run, which does happen with regularity, I will quicken my step for the one who has no step. As I am enjoying the breeze in my face, I will allow it to be a reminder of the resistance others have that keeps them from the joy of a run. I know there are plenty of folks who are wholly capable of experiencing this joy and who cringe at the thought of a perceived tortuous run. There are others, much fewer most likely, who understand what I am driving at here. And to those I say this - this week enjoy your runs a little bit more. In spite of speed, unachieved goals, nagging injuries, or whatever other ailments there might currently be in your running life, you're out there running! So smile and go get some miles. Run as the young adults on stage performed this past Sunday, in a dance of smiles and wonder. I have mentioned before how amazingly mobile my wife's job can be. It's truly amazing in every sense of the word. Sometimes we travel just for fun but she has worked it out so that usually when we travel she is work-cationing. Is it too late to go back and become an emergency medicine physician? Maybe. And besides most of the places she goes/we go as I tag along, are often places where only one doc is needed. So even if I were a physician I would be coming along in other various roles just as I do now. In the case of this trip, I come along simply as a passenger. It's not a bad way to go, and there are certainly worse options. It does confirm the job title I gave myself when we were opening a bank account a few years ago in New Zealand. When the lady asked me my job title I floundered a little on how to describe my role of an unemployed husband following my wife around the world. She said, "You're a man of leisure then?" And something about the way a Kiwi says the word leisure sounds way better. "Yes ma'am, I am a man of leisure." Do I love that the title is ambiguous and perhaps even misleading? Yes. So, as an international man of leisure, I write this post about one of the best ways to spend time in said profession - on a cruise boat in the Antarctic waters. A few years back Sarah applied for a job working as a doctor for a cruise boat company called Quark. They take passengers on expeditions to the wonderfully hard to reach wonders of the Arctic and Antarctic waters. By clicking on this line you can read about one of the three posts I wrote describing our Arctic trip (warning as there are amazing photos of polar bears!). 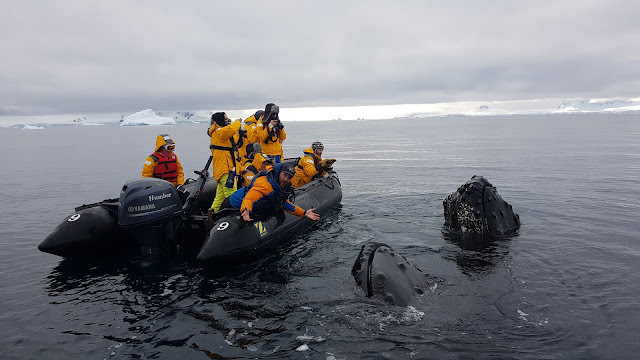 We had a fantastic trip and had been looking forward to any other adventures we might be able to make possible through such spectacular opportunities to travel in the vast areas near either of the poles. As we were finishing our time at the South Pole, Sarah started looking into this seasons possible trips through Quark and applied for a few. Long story short, she landed three trips to the waters just off Antarctic Peninsula! She packed her bags and headed off for the first two, and as her companion I was granted access to joining her for the third and longest of her expeditions. For anyone who asked why we would go back to Antarctica after having lived at the South Pole (click here for the first of many South Pole posts), this post should quell any more questions. While on this note though, I can safely say the experiences I have had in the Arctic and Antarctic have only made me want to visit both of them again and again. Each trip misses animals on the list of those we both want to see. Every trip takes us somewhere we have never been but misses some other wondrous island or historically charged spot we have not managed to make it to yet. Why again? I think the pictures will do most of the talking. If anyone is still not convinced just ask me and I'll come talk to you. (Notice the one penguin who looks different? The trip was a blast! We saw penguins (Adelies, Gentoos, Chinstraps, and one King penguin), whales (mostly lots of Humpbacks, but also two Minke whales - no Orcas for me but Sarah did see some on her first two trips), seals (so many Crabeaters, Fur seals, Leopard seals, a few elephant seals, and some Wedell seals), and so many different kinds of Antarctic birds. I think instead of writing a long post attempting to describe the wonders of this trip, I will simply share some of the photos. Hopefully there will be an official story through one of the Guideposts magazines I can share later about some of the experiences we had with the animals, but for now I'll keep it short and sweet. The whales stole the show! 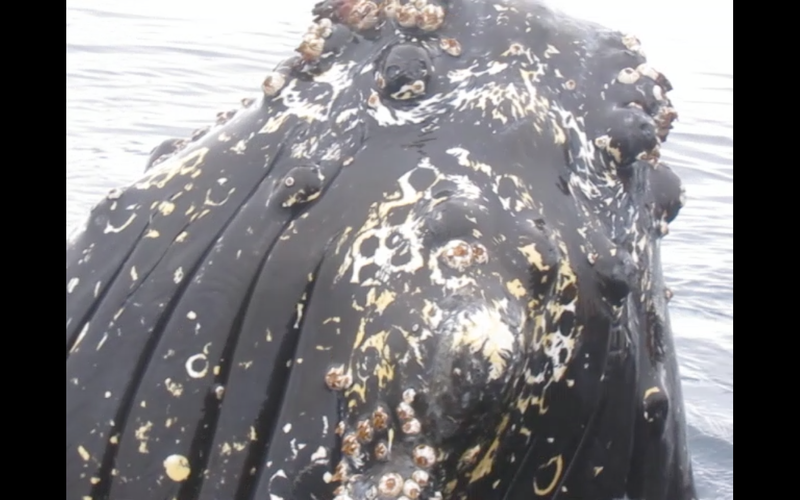 We had some Humpbacks who decided to just come up one day and give us about a fifteen minute investigation. It was one of the most amazing experiences of my life! Such enormous creatures just gently lazing on the surface, peering up at us through the water with the massive eyes. Such a fun time! Pictures!! We also were able to make several landings to old stations, abandoned whaling stations, and even a station still in use for scientific research. These were certainly fantastic experiences as well. After wintering-over at the South Pole, it was unique to see how other people have lived or are living at their stations in other parts of the Antarctic. The coastal stations are quite different from one 800 miles inland. Really neat to note the differences and similarities. More pictures!! These are just some of the best we took. Hundreds more of course.